“It has recently been demonstrated that the Garden of Eden was not in Palestine, but is still situated on the Shoshone Indian reservation in Wyoming and that the variety of apple with which Mother Eve was tempted is still grown on a ranch just outside the reserve.” — Gov. Fenimore Chatterton, speaking at the Louis and Clark Exposition, St. Louis, Missouri, July 11, 1904. 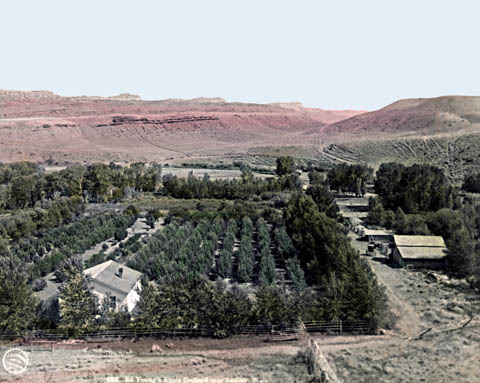 Ed Young’s apple orchard near Lander, 1903. It all started in 1882, when Lander rancher Ed Young planted his first apple trees, the first planted in Wyoming, on his homestead on the Little Popo Agie. Despite setbacks caused by climate and weather, Young kept experimenting with varieties and grafting techniques. By the turn of the century, Young’s apples were known throughout the region for their quality and his displays were the highlight of county and state fairs. 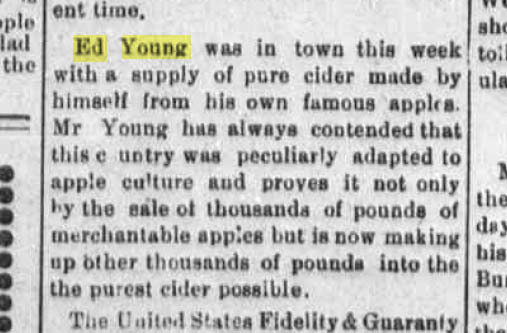 In addition to selling fresh apples and other fruits to local stores and restaurants, Young also made cider. 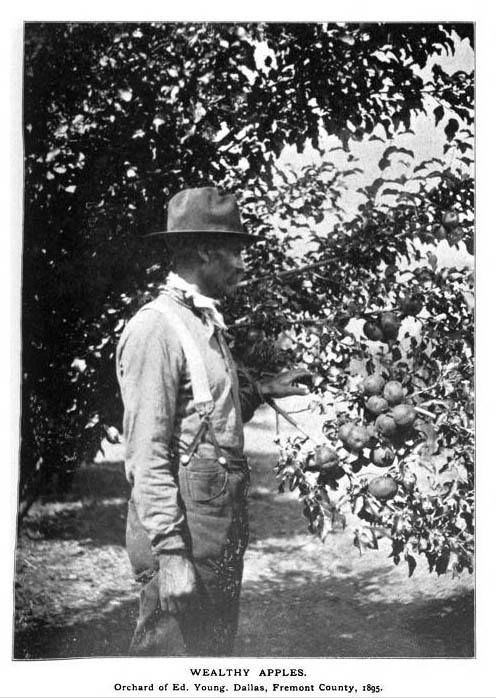 Ed Young with one of his “Wealthy” apple trees, 1895. This was one of his most successful varieties. These hardy and prolific trees were developed by pioneering Minnesota horticulturalist Peter Gideon. In 1897, nearly half of Young’s 2,000 trees were Wealthys. 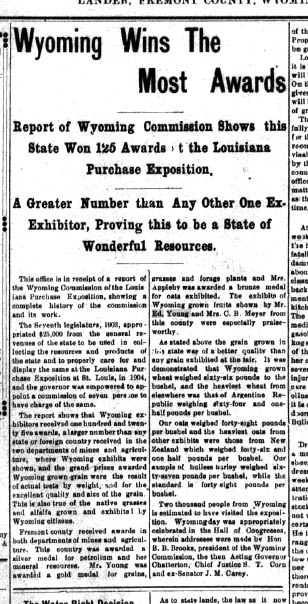 Governor Chatterton, an enthusiastic promoter of Fremont County, mentioned the apples in his address on Wyoming Day at the Louisiana Purchase Exposition in St. Louis in 1904. Young’s apples lived up to the hype and though they did not win awards, were highly praised as making great progress in the region. Governor Chatterton’s praise was well deserved. Fremont County’s apples were highly praised at the World’s Fair. By 1904, Young’s orchard of more than 2,000 trees was said to produce 60,000 pounds that season. 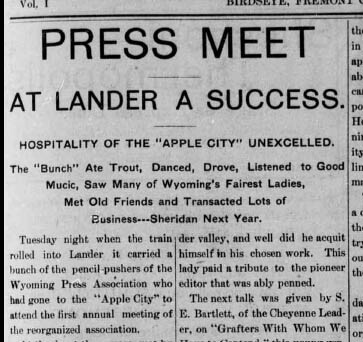 That same year, the newspapers and promoters began calling Lander “Apple City” and Ed Young the “Apple King of Wyoming.” The town used Young’s success to help promote settlement in the area and even made an unsuccessful bid for moving the state capitol from the “temporary” Cheyenne to the more hospitable climate in Lander. Lander began to be called “Apple City” in 1904, in no small part because of Young’s successful orchard. 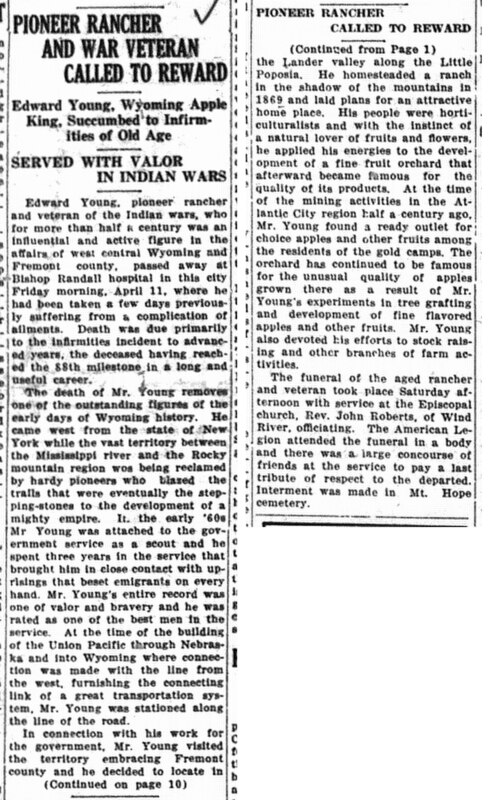 Despite the success of his orchard, which included cherry, plum, peach and other trees, the Great Depression was hard on Mr. Young who was no longer very young. Only a few weeks before his death in 1930, at the age of 86, Young lost his farm to taxes. Still, he is remembered fondly for his passion for horticulture and left a lasting legacy in Wyoming’s fruit industry. His successes in Fremont County inspired many other farmers and ranchers to attempt orchards in Wyoming’s difficult climate. And more than 100 years later, some of Young’s apple trees are still producing. The Wyoming State Journal, Lander’s local newspaper, recounts how Young first came to Fremont county as a scout for the US Army and homesteaded the land he would turn into his orchard paradise.